Rosita TSE, coach of the Hong Kong Synchronised Swimming Team, makes her first bold try in life – providing training to a group of seniors with an average age of over 73 by letting them take upon themselves a synchronised swimming challenge, so as to break the barrier put up by their age. In the previous episode, the eight elders had gone through the first stage of training, in which they overcame the challenge of performing five basic synchronised swimming moves in the mid-term test, including backstroke kicks, continuous spins, “head first sculls”, “eggbeater kicks” and double patterns. In this episode, they are divided into two teams by gender for the ultimate challenge, which is even more difficult than the previous one. Each team takes on the challenge of a one-minute team synchronised swimming task. The performances will be scored using the artistic impression, difficulty and execution as evaluation criteria. Synchronised swimming is an aquatic sport that integrates music, gymnastics, dance, and swimming strokes. Athletes need to perform moves such as lifts, turns, twists, and verticals without touching the bottom of the pool. It is sure that the athletes will achieve twice the result with half the effort if they have learnt dancing before. “Dry land training” is one of the drills on land in synchronised swimming which imitates dance. Athletes can have a better understanding of each move through imitating in-water swimming strokes on land. To the elders, swimming may be as easy as a hand’s turn, but dancing may be a totally different matter. It seems that the essential elements required for synchronised swimming such as speed, agility, flexibility and coordination are all related to age. To surmount the difficulties, the seniors have no other choice but to train hard. Apart from the pool trainings, they practise hard on the beach every single day. Will their diligence and determination help them overcome the age barrier, so as to create an unprecedented chapter in the history of synchronised swimming by performing the beautiful and elegant sychronised swimming moves in front of the audience for one minute? People only think of the Olympic Games and waterproof cosmetics at the mention of synchronised swimming. In fact, synchronised swimming was listed as a female event in the 1984 Los Angeles Olympic Games that was split into solos, duets and teams. Moreover, the first mixed synchronised swimming event was held at the 2015 FINA World Championships, although no man has ever participated in the synchronised swimming event in the Olympic Games. Synchronised swimming is an aquatic sport that integrates music, gymnastics, dance, and swimming strokes which is also known as “Water Ballet”. Athletes need to perform moves such as lifts, turns, twists, and verticals while excellent teamwork and consistent action are also required among the teammates, so as to demonstrate their strength, speed, stamina, flexibility and agility above water along with musical accompaniment. In competitions, technical merit and artistic impression of athletes would be employed by judges as marking criteria. Rosita TSE has been adept at swimming since childhood, and she has become attached to synchronised swimming after her first encounter with it at 14. 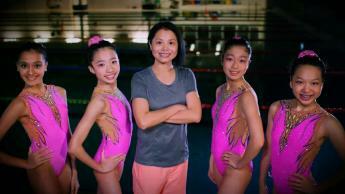 At the age of 16, she represented Hong Kong to participate in a solo event in a national competition in the USA for the first time, after which she even became the coach of the Hong Kong Synchronised Swimming Team at 24. In 2002, she participated in the Busan Asian Games as an athlete for the last time and took the sixth place in duets. 12 years later, she led the Hong Kong Synchronised Swimming Team to compete in the Incheon Asian Games and won the sixth place once again from which we could see the silent endeavours that had been made by the team. Rosita TSE considers synchronised swimming a sport that is both tough to learn and master as it may take over thousands of times of practices to perfect just one move. Through her personal experiences and unnerving spirit, she seeks to bring the Hong Kong Team to a new height in the aspect of synchronised swimming. This time, she attempts to train a synchronised swimming team of eight elders for the first time, which is a significant challenge in her career as a coach. Synchronised swimming emphasises on aesthetics, as such, most players are young ladies. However, our challengers in this episode are seniors aged 60 to 84. They are all regular winter swimmers in Clear Water Bay, and they have been swimming every day at the beach for decades even under inclement weather. To prove the “sense of worthiness among the elderly”, they take upon themselves the invitation regardless of the inquisitive gazes from the public and partake in the training of synchronised swimming and its challenge, including performing five basic synchronised swimming moves consecutively and the ultimate challenge: complete a set of synchronised swimming moves with musical accompaniment in a group of four. Airsoft IPSC (IPSC) is a sport that requires speed and accuracy. Shooters are to get the highest point possible in the shortest time in every round of a competition. Winning or losing is often decided within seconds. The keys include how fast a shooter pulls out his gun, physical reaction, limb coordination and memory strength. IPSC differs from wargame, in which players rival in a battle, that IPSC shooters do not target at human or animals, but only paper and metal dartboards. IPSC stresses the importance of discipline and safety, as well as the advocation of a positive attitude in shooting. William WOO, also known as “Sir Macho”, started to learn IPSC in 1999, making him an IPSC pioneer in the city. 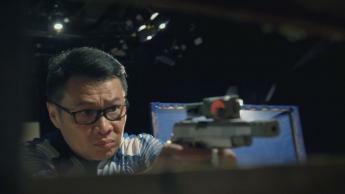 In 2008, he was awarded Hong Kong Airsoft Practical Shooting Confederation’s champion shooter of the year. WOO founded HK Shooters in 2009 and became their vice-chairman. During 2009 to 2011, he coordinated training courses for IPSC coaches in the territory. From 2011 to 2013, he was the chief coordinator of the Hong Kong Open Airsoft IPSC Shooting Competition (HONG KONG OPEN). WOO has always been a key personnel in the local arena of IPSC. Guns give a rather macho impression, but in this episode we will invite three heroines to accept a challenge! In addition to an instructor of tabletop games, Helen is also a queen of computer games. She definitely knows the tricks of shooting games as the champion of a computer game competition, and is determined to achieve her goal this time! Social worker Chocolate is active in theatre, energetic and excels in everything from swimming and waterskiing to hiking. She will absolutely spare no effort in this challenge. The seemingly quiet and inactive Charlene proves to be a sport enthusiast whose hobbies include horse riding and running. Eager to win, she will try to attain the best results possible for sure. This time, they are to take up the challenge of entering a competition’s open division for beginners after only two months of training, vowing to win the championship! As the name suggests, mountain biking differs from riding a bike on ordinary flat tracks in the city. Through its unique design such as derailleur and shock-absorbing, a mountain bike enables the cyclist to rover across mountains, as well as uneven slopes. Packed with excitement and speediness, it is a sport that requires courage, concentration and judgement. Having represented Hong Kong in sport events for 14 years and 3 times in Olympic Games, CHAN Chun-hing earned the nicknames “Mountain Hing” and “King of Mountains”. Coach of the Hong Kong Cycling Team, SHEN Jinkang, once described that CHAN was persevering in a sport item in which he can barely become a rival within the international circle. He was also the only full-time mountain cyclist in Hong Kong. Since his first contact with cycling in Secondary Two, CHAN instantly fell in love with it. 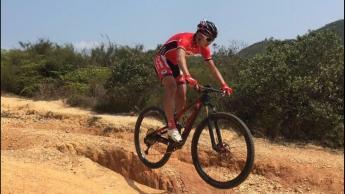 After joining the Hong Kong Cycling Team, he specialised in mountain biking, receiving long-time training all alone. For years, he had been facing competent contestants all across Asia in solitude. He had to overcome countless obstacles in order to win his awards and secure his status as a top mountain biker in Asia. He won the champion and the first runner-up in men’s cross-country cycling in 2010 and 2014 Asian Games respectively. In 2016, CHAN officially put a full stop to his athletic life after serving as a flag-bearer in the closing ceremony of the Olympic Games. However, as mountain biking is an indispensable part of his life, CHAN has switched to become a coach of mountain biking. He hopes to promote this sport by utilising his own experience, so that more people will become mountain bikers. Athletes usually have undergone strenuous training, therefore do not surrender easily when confronted with challenges. They are always determined to fight and persevere until the end. This episode features 3 handball players, including athletes who have repeatedly represented Hong Kong in competitions abroad. After over 15 years of handball training, the three of them are used to sports that place emphasis on team spirit such as handball. Now they would like an opportunity to challenge themselves with a sport that stresses individual performances. They will have a taste of having the mountain bikes, instead of team members, as comrades. Starting from basic hard-surface training, they will then move to the forest and mountains, putting the spirit of “sports know no bounds” into real practice throughout the learning process and the contest. Roller Skating was extremely popular in the 1980’s both as a recreational sport and a trend. In the mid and late 1990’s, inline roller skating started to gain popularity. With its improved equipment that makes it easier for skaters, it has become a hit in Europe and America, and even developed into a professional sport. There are several types of roller skating sports – speed skating, artistic roller skating, freestyle skating, inline hockey, and rink hockey. Now included in tournaments in many places around the globe, speed skating is also featured in its own sport competitions. A retired local roller skater, Angie has loved the sport ever since her first time skating at the age of eight. In fact, it was her mother who liked roller skating in the first place but lacked an opportunity to skate. When the chance came, she encouraged Angie to give it a try. Angie was reluctant at first, yet skated for four hours after entering the rink. Later, Angie went to practise nearly every day. The rink in Victoria Park was basically her second home. There she met a lot of like-minded friends and trained many students. She focused on artistic roller skating earlier, but later switched to speed skating. Angie’s best result is winning the first runner-up in a national Chinese contest in 2001. Afterwards, she retired to study in Australia, deciding to leave the roller skating arena for good. Unexpectedly, her younger sister’s fame and outstanding performance in roller skating contests made her eager to skate again, and so she returned to the scene of roller skating. Now she is mainly devoted to the work of a coach and a judge, as well as the promotion of roller skating. She often steers athletes from various regions to competitions in different parts of the world. In Hong Kong, children and teenagers make up the majority of learners of roller skating. This time, however, we will be training adults who are also parents! They are all over thirty years old. As parents, they experience immense pressure from everyday life, family and work. They spend most of their energy and time on their children, which leaves them minimal time for physical exercise. Yet these parents have decided to leave their family behind for a moment to put on the skating shoes and take up the challenge of learning a new sport. Their challenges include a speed skating race in which speed is the key to winning, and an obstacle course that requires simple figure skills. Finally we will see whether they can manage a freestyle roller skating race that demands sophisticated techniques. Kayaking is a sport that requires stamina and strength. When one is kayaking in the boundless sea all alone, not only does it take willpower, but it is also human’s intimate moment with ocean and nature. Dragon Boating is a sport that requires explosive power and team spirit. In order to row a dragon boat loaded with over 10 persons to the finish line, solidarity matters the most, thus every member has to pull together in unison with rhythmic paddle stroke. Although these two forms of rowing sports are similar, the spirits behind them are different. However, individuals, communities, and nature can be blended harmoniously if the two are combined. In this episode of “Sports for All”, kayaking player Angel HO and dragon boat coach Jacky SO work together to train a group of blind persons, so as to test their willpower and team spirit through kayaking and dragon boating. Angel HO came into contact with kayaking when she was 26 and immediately fell in love with the sport. Months later, she participated in the kayak race in Tuen Mun District and won the championship after which she has begun her journey as an athlete. Since 2010, Angel has started participating in international competitions and has captured championship successively in the kayak races held in Taiwan, Malaysia, Korea, etc. In 2014, she even represented Hong Kong to participate in the kayak race of the Asian Games in Incheon. In recent years, she devotes herself as a coach in the hope of inspiring younger generations through kayaking. Big Brother teaches Kung Fu to hearten other blind persons; Uncle Fat plays music in search of inner tranquility; Loaf builds his business of selling cookies to prove his capacity; Clara works as an actress to conquer her inward fears; and Wing-chi actively partakes in group activities. This time, they join the Kayaking / Dragon Boating training of Angel HO and Jacky SO. Not only do they have to participate in a dragon boat race to build a connection to the world, but they also have to complete a test of kayaking for 100 meters alone which challenges both their willpower and team spirit. Street workout has gained popularity around the globe rapidly in recent years. The thing most special about it is that it neither costs a penny to purchase any equipment or membership nor is confined to location and time. One only needs to make use of the park facilities near his / her home plus one’s body weight to train various body parts by using different apparatus, so that all kinds of awesomely challenging positions can be assumed, such as the iconic “Human Flag” position, it is, therefore, well-sought after by more and more sports devotees. The 23-year-old Nicolas WONG first came into contact with street workout four years ago. He is now a tertiary institute student as well as a part-time street workout coach. Four years ago, he was not into sports at all and lived a secluded life with only video games in his company. One time, he watched a short video about street workout online by serendipity and was beguiled by its dazzlingly classy moves after which he immediately went to take a shot at a park nearby. He has then fallen in love with this sport and has been training painstakingly for it every day ever since, eventually turning a “loser” into the champion of street workout in Hong Kong. In 2016, he even represented Hong Kong in a competition overseas and came fourth in the Street Workout World Cup Super Final. In the eyes of Nicolas, street workout takes three things: Willpower, willpower, and willpower! This time, our production team has specially invited four hectic urban office workers who will have to undergo months of training to acquire the basic moves of street workout. With their daily time occupied by works, families, social lives, etc., it is by no means easy for them to squeeze time for exercise. Will they be able to complete the ultimate test set by the production team: the four working together to design and perform a three-minute street workout show in public. Rope skipping is not only a children’s game, but also a sport that involves ever-changing styles and emphasises on physical strength, concentration, endurance, body coordination and overall cooperation. Whether it is individual or group performance, rope skipping is a sport that pleases our minds and eyes. CHEUNG is a member of the Hong Kong Rope Skipping Team. He is the men’s individual overall champion of the Hong Kong Elite Rope Skipping Championship 2017, and he ranks 5th in the World Rope Skipping Championship 2016. CHEUNG has been a relatively quiet person since childhood, and he first came across rope skipping in Form 3. CHEUNG’s talent and effort take him into the Hong Kong Rope Skipping Team in merely half a year to participate in international competitions. His life is linked to the sport since then. In his secondary school years, he was almost forced to give up rope skipping because of his declining academic performance, resulting from his daily rope skipping practice. However, with his passion for rope skipping, he manages to take care of the sport and his academic work. He takes university courses and opens his own rope skipping company, hoping to develop his hobby into a career. Ten Primary Six students from the Hong Kong Federation of Youth Groups Lee Shau Kei Primary School and each of them have different strengths and weaknesses. Some may have relatively weak hands and feet co-ordination while some have may not have the best understand ability. In addition, they only first came across the sport in their usual Physical Education lessons, yet this time they will be trained by our “Coach for All” to face various challenges. First, they have to face the challenge of their personal speeds, being the 30 seconds alternate foot jump, and the 30 seconds criss-cross. And the ultimate challenge is to participate in a performance cup competition, the ten students have to complete a 4-minute group performance. A sports climbing competition include bouldering, lead climbing and speed climbing. It is a test of physical and intellectual capacities that requires bravery and body coordination. Climbing enthusiasts take pleasure in conquering different routes. We can see magnesium powder chalk, which climbers use to prevent slipping, on natural and artificial climbing walls, as well as bouldering gyms. To Hong Kong’s climbing athletes, there is also a unique major climbing event – the annual Bun Scrambling Competition in Cheung Chau. Climbing appears to be a process of mounting to the top step by step, but it is letting go and falling that beginners have to learn first. As you climb, you need to get used to your body’s height on the wall and grab the rock firmly. However, during a break you have to let go of your grasp on the wall and rely solely on the rope to hang you in mid-air. In bouldering, where the height is limited to 6 metres or below, the climber falls directly on the mat in case of a loss of grip because a rope is not applied. The only way to continue climbing is through overcoming the fear of falling. A climber needs to observe the route and then imagine how the limbs may be deployed before mounting upwards with explosiveness. Progress will certainly be made if you keep on practising. Every seemingly impossible route conquered brings unlimited satisfaction to the climber. WONG Ka-yan is a five-time Queen of the Buns in Cheung Chau’s Bun Scrambling Competition. Having lost both her lover and her school life after graduating from Secondary Five, Ka-yan joined an interest class at the community centre. She chose rock climbing because she wanted to boost her courage and overcome her fear of heights, and has loved climbing since then. Ka-yan is also the first ice climber in the city and a multiple award-winning tree climber – she simply loves every form of climbing. She won the champion in Women’s Lead and Speed category of the National Elite Natural Rock Climbing Competition 2016, the third runner-up of Women’s Open category in the Hong Kong Bouldering Championships 2017 (the best result among Hong Kong representatives), and the first runner-up of Women’s Open category in the Hong Kong Speed Climbing Competition 2016. Despite being interested in rock climbing all along, these three students lack climbing companions. This time, on their first attempt at the sport, they will participate in months of training and take up three challenges. Weighing more than 200 pounds, Hei has to put up with his own weight in every step he climbs, adding to the belly that hinders climbing. He considers not giving up midway a “victory”. Ho’s thigh is even thinner than Hei’s arm. How would Ho handle a rock wall of over 10 metres high in a lack of muscles even though he plays volleyball regularly? Geeky Harry is afraid of heights. Not only does he shake as he climbs, but he also does not know how to exert forces correctly, and stays close to the wall. Can climbing demonstrate the brave side of his eventually? We can picture athletes in an air of overwhelming greatness when they have climbed up to the peak against the mountains behind. These three students, however, do not seem to fit in this image at all, being either too chubby, skinny or geeky. Climbing can be regarded as an impossible mission for them. Basketball is a prevalent sport in Hong Kong that integrates strength, speed, teamwork, skills, and height. 3-on-3 half-court basketball is usually played on the outdoor basketball court in Hong Kong which allows players to apply their individual skills. However, the official 5-on-5 full-court game requires more than individual skills, it also sets a high bar for players’ physical fitness, teamwork as well as tactics and strategies. LI Ka-yiu used to be a professional basketball player in the A1 Division of Hong Kong, and he was also a member of the Hong Kong Basketball team. With a height of six feet one, he served the position of the four and was scorned as the shortest power forward in history. LI Ka-yiu loves basketball, and he has become a basketball coach after he retired. He perseveres in passing on the legacy of basketball and has, therefore, become the assistant coach of the SCAA Basketball Team in the A1 Division. He believes that with perseverance and assiduous training, everyone could overcome his / her weak natural physical endowments and go head to head with other players. Team Kirin is a teenage basketball team set up for just over a year with the assistance of social workers in which members aged 12 to 17. 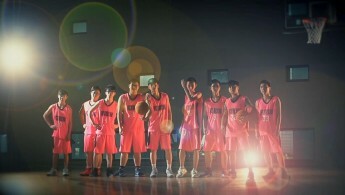 Unlike any basketball teams in secondary schools, Team Kirin neither picks people with outstanding physiques to become members, nor trains regularly because the team was set up with a view of letting members indulge in the fun of basketball as well as promoting their self-esteem, confidence, and discipline. In addition, the team has not undergone any professional training due to the limitation of resources. Although the team’s performance is inferior in every aspect, they fight on despite all the setbacks and actively participate in different competitions. They hope to quit being the “team for the taking” through professional training. In this episode, LI Ka-yiu spends half a year to instruct and train Team Kirin, so that the members can improve their individual skills and physical fitness, and foster their teamwork as proof that “Sports for all” is true as long as devotion is dedicated. Every member of Team Kirin has to undergo tests and complete passing, lay-up shots and shooting within designated time limits in the hope of making significant progress in every aspect. They also have to accept an ultimate challenge from Team Mediator, a team which builds friendship through basketball with our Host NG Ka-him in it, to practice and learn basketball skills from each other.